Guernsey has so many options for walkers, including some wonderful route options around our island’s capital, St Peter Port. Whether you want to explore “town” as part of your visit, or you’re a visiting cruise ship passenger with a limited time on shore, taking a stroll around the streets of St Peter Port is a great way to dig a little deeper into island life and Guernsey’s history and culture. 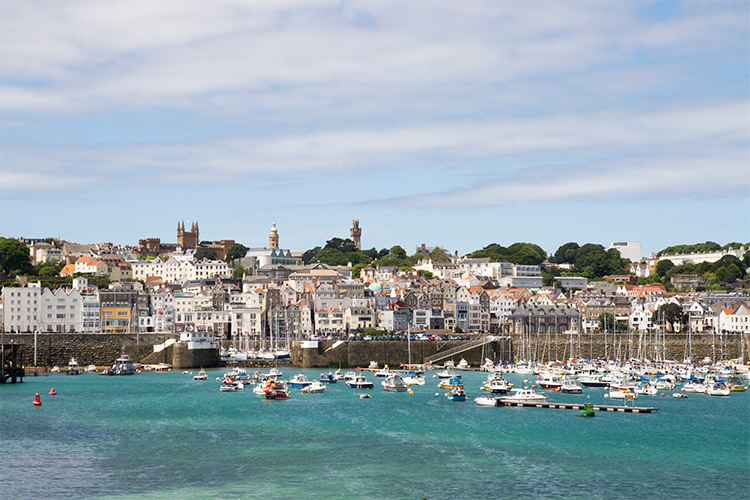 You can of course extend the duration of this walk by stopping off at the various attractions along the way, such as Victor Hugo’s Hauteville House, a coffee or a browse around the shops of The Old Quarter, or Candie Gardens and The Guernsey Museum and Art Gallery. Terrain: Pavement or pedestrianised streets. Hilly, with some steep sections and steps. From the Town Terminus on South Esplanade at the foot of Castle Pier (where most buses and taxis drop-off and depart from), head north towards the town centre to the junction overlooked by the statue of Prince Albert (and just below Town Church). Turn left and then left again to take you onto Cornet Street and then keep bearing left uphill onto Hauteville. Pass Hauteville House (or perhaps pay Victor Hugo’s recently refurbished home in exile a visit). At the top of the hill, at The Dorset Arms, bear right onto Les Vardes and then take a path on the right. This path dog-legs and then emerges just above the junction where Charotterie splits into Park Street and Rue de Pré. Walk along Park Street, past Tiger Lily Florist, and then turn right down Upper Mansell Street. 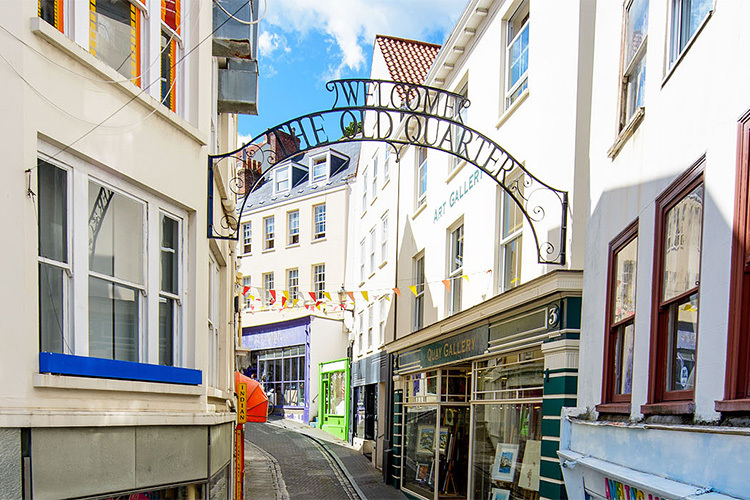 Mansell Street becomes Mill Street and St Peter Port’s Old Quarter; a district characterised by small independent shops and galleries. Mill Street heads downhill to The Market, and if you keep to the left of that building, the pedestrianised Market Square. At the bottom of Market Square, descend to Town Church and the end of High Street. You can go “around the block” to visit some of the town centre’s smaller and more specialty shops and cafes here, before walking along High Street. Proceed along High Street, past Berthelot Street which heads up to the left just past the branch of HSBC bank, and turn left at Lloyd’s Bank up Smith Street. At the top of Smith Street is a roundabout covered with mature trees, on the opposite side of which are The Sunken Gardens. Take the second exit, next to the Sunken Gardens, up St James’ Street to St James’ Concert and Assembly Hall on the junction with College Street. Turn right, and then bear left on to Candie Road. We would suggest walking all the way to the top, to the Priaulx Library entrance and then walking down through the gardens, perhaps stopping in at the Guernsey Museum and Art Gallery, then bearing left and exiting Candie Gardens at the north east corner. Turn right along the road, then turn left at St Julian’s Avenue. Walk down St Julian’s Avenue to the large roundabout at the seafront (you’ll be directly opposite the North beach car park). Cross onto the seaward side of the road (aim for the Herm Trident kiosk) and then walk south along the seafront past the marinas, Victoria Pier, Albert Pier, and back to your starting point at the Town Terminus. You can then walk out along Castle Pier to Castle Cornet, and along to the small lighthouse at the end of Castle Emplacement, and back again, before heading back to the Bella Luce to rest your feet with a Wheadon’s and tonic and a bite to eat.